This weekend will be a clash of some of Richmond’s finest wrestling heroes as they take each other on at The Hof all to benefit a local children’s non-profit. The Scott’s Addition rooftop bar and venue has partnered with Pure Pro Wrestling and the Richmond wrestling legend himself, The Progressive Liberal to put on a knock down drag out event this Friday. All of the proceeds from the event will go to the Children’s Miracle Network, a non-profit organization that raises funds for children’s hospitals, and advocates for medical research for children’s health issues. The headlining match, dubbed “The Battle for the City,” pits hometown hero Chris Silvio against underdog Richmond native Timmy Danger. Silvio and Danger are both returning to the city after several years away. Silvio is the favorite in the match, but Danger said that a lot has changed since Silvio has been gone. Danger broke into the wrestling business in 2005 in Richmond, but has since moved to Louisville to train with Rip Rogers and Al Snow. He has wrestled all over the midwest and east coast and hopes that this match will bring wrestling back to Richmond in a big way. Silvio, a seasoned pro who has competed all over the United States and Europe, is well known in the Richmond Area. He was the co-promoter of the popular wrestling series Richmond Lucha Libre in 2009, but left the city shortly after to focus on coaching and wrestling abroad. His last Richmond match was in 2012 at the Richmond Convention Center. Silvio said that he will easily handle his opponent on Friday night. In a separate bout, wrestling legend Dan Richards, “The Progressive Liberal,” who has recently appeared in segments on The Daily Show, ABC News, and Vice News, takes on “The Champion of the 1%” Logan LaRoux in his first Richmond match since 2004. Richard’s wrestling persona provokes strong reactions among audience members, and he has garnered a good deal of attention in recent years as the national political climate has become increasingly polarized. 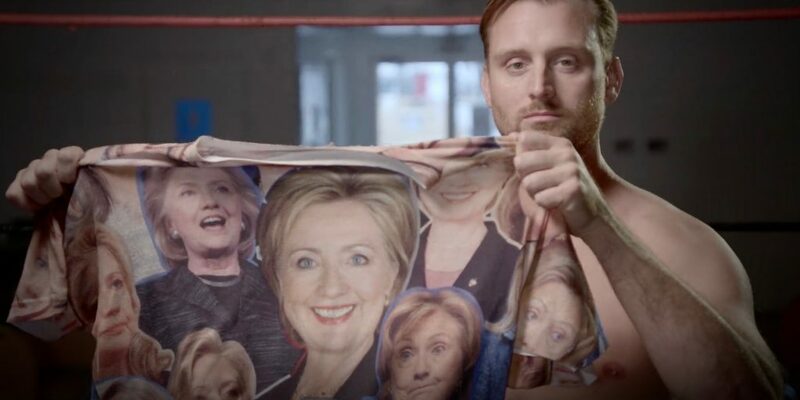 His typical fighting attire is a speedo sporting the phrase, “Dump Trump,” and a t-shirt covered in smiling Hillary Clinton faces. He has been known to taunt the crowd by desecrating the Confederate flag, or by yelling “Hillary” in his opponents’ faces after knocking them to ground. Richards, who helped put together the charity event, contributes to the Children’s Miracle Network regularly, but said that he wanted to do something on a grander scale. “Those children deserve anything good they have coming to them,” he said. As for his stage persona, he said that he thinks he will be well received in Richmond, but that if it were New Kent or Powhatan it might be a different story. In addition to these intense matches, wrestling sensation and Evolve star Jason “The Gift” Kincaid will square off against DeJuan “The Juggernaut” O’Neal. Doors open atg 7 PM and bell time kicks off at 8 PM. Pre-sale tickets are $10 for kids 12 and under and $15 for adults and $15 and $20 at the door. Hopefully, we will get to see The Progressive Liberal rattle some Trump fans once he enters the ring. RVA Magazine is a proud sponsor of this event. Photos from Progressive Liberal Dan Richards.